The Kent Ridge Guild House is the largest of the three guild houses managed by the National University of Singapore Society (NUSS). It offers a plethora of facilities including a fitness centre, a swimming pool, squash and tennis courts, restaurants, bars, karaoke rooms, and billiard and function rooms. Situated within the NUS campus, it is a great place to unwind and meet up with fellow friends and graduates. The Kent Ridge Guild House is part of the Alumni Complex, which is the realisation of a collective vision shared between NUS and NUSS to foster a greater sense of belonging and camaraderie among the alumni. The Kent Ridge Guild House contributes to this initiative by engaging the alumni in a series of activities and programmes and providing them with a “Home on Campus”. For more information on parking at the NUS Kent Ridge Campus, please visit the NUS Office of Estate and Development's website here. 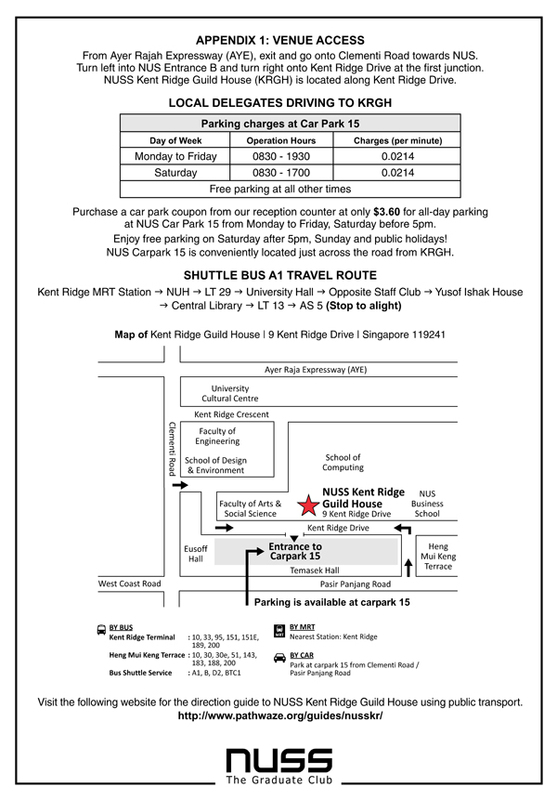 Click here to view full list of operating hours of facilities at Kent Ridge Guild House.